After installing the extension head over to the download you wish to require acceptance of your Terms & Conditions. A new download option is added to your Download called Terms & Conditions Required. After checking this new option and saving your download, your visitors will no longer be able to download this file without accepting your Terms and Conditions first. The Terms & Conditions extension comes with a new shortcode that will display the Terms & Conditions acceptance checkbox and will display a download button to the file after the visitor has accepted your Terms & Conditions. You need to pass your download ID to this shortcode, we used download ID 5 in our example. Instead of displaying the Terms & Conditions form on your page you can also display the default download link/button by using the [download] shortcode. When the visitor clicks the link/button, Download Monitor will redirect your user to your No Access page because they haven't accepted your Terms and Conditions yet. The Terms & Conditions extension automatically appends the Terms & Conditions form to the No Access page so your visitor can accept them and start their download there. If you've followed above steps in the Usage section your download is ready to go. Visitors will be have to accept your Terms and Conditions prior be granted access to the download. 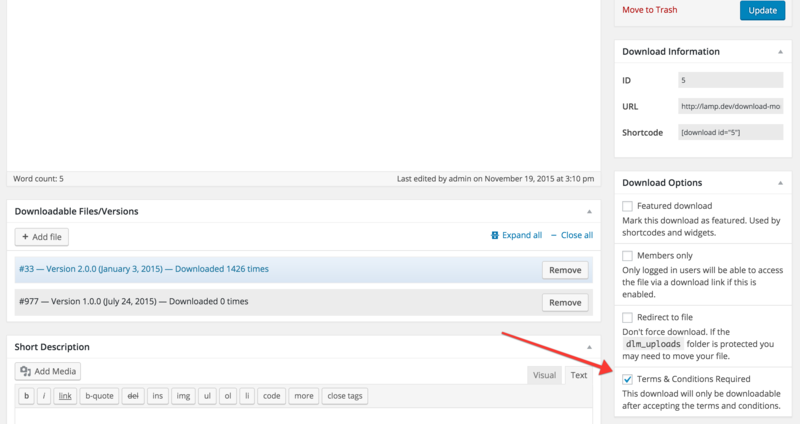 After the visitor checks the checkbox the download button will become enabled. We also check on the actual download request if the Terms and Conditions were accepted so visitors can't share the download URL. Can I require all of my downloads to require my Terms and Conditions to be accepted? You can! Head over to the Terms & Conditions tab in your Download Monitor settings and check the All downloads require Terms & Conditions option. Can I change the Terms & Conditions text that is displayed next to the checkbox? You can! Head over to the Terms & Conditions tab in your Download Monitor settings and change the text in the Terms & Condition Text option. This field accepts HTML so you can also add a link (<a>) to a separate page which contains your full Terms & Conditions here. Can I change the Terms & Conditions form HTML that is displayed? You can! The Terms & Conditions extension comes with an overridable template file tc-form.php. Copy this file to your the download-monitor directory in your theme (create the directory if it doesn't exist) and modify the file you just copied to your theme any way you want. This way you can still safely update the extension without losing these customizations!